RACHEL HOWARD earned her MFA in fiction from Warren Wilson College and is the author of a memoir, The Lost Night. She is the recipient of a MacDowell Colony fellowship, and her fiction, essays, and dance criticism have appeared in the San Francisco Chronicle, the New York Times, the Los Angeles Review of Books, Waxwing, and elsewhere. She lives in Nevada City, California. "Rachel Howard has given us a portrait of family-building and attachment that is at once beautiful and painful, serious and funny, page-turning and insightful. I was deeply moved by this novel, a powerful reminder of the risks we take on whenever we love anyone." "I’ve never read anything so beautiful about the intricacies of adoption—the process itself, and the seldom-talked-about aftermath. The prose is elegant and compressed; I often had to stop reading to catch my breath. Anyone who has ever loved a child, in any capacity, should read this book." 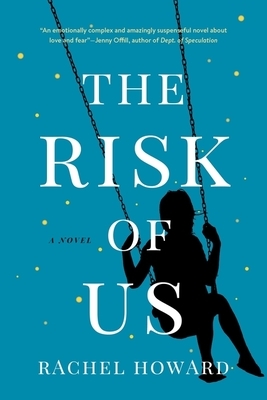 "The Risk of Us is a spare, poetic, and fearless narrative that explores the question of what makes—and keeps—a family together. Be prepared for an absorbing, unflinching chronicle of the formidable difficulties and vast rewards of love." "Rachel Howard’s The Risk of Us (so accurately titled) is a novel of deep pain yet also laughs—lots of them. Nothing is easy in this book, and that’s as it should be. With risk comes a kind of awesome grace. A wonderfully written and candid examination of what it means to be a family." "Howard works with an elegant complexity, rendering family life with its necessary cocktail of pain and humor and pathos. She's the kind of writer I admire most: an unflinching, savage, and ultimately tender eye trying to make sense of all our confusions."